This is the fourth in this series of 26 posts, one for each letter of the alphabet, that I am writing during the Blogging from A to Z Challenge, April 2016. You can find all the posts, as they are published throughout the month, by following the A-to-Z April 2016 tag. The place where we practice Aikido is called a dojo [DOH-joe]. Like the word “church,” “dojo” refers to a physical space, and also to a group of people who share important values, ethics, and commitments. Some dojo (plural is the same as singular) have permanent facilities, and some hold classes in community centers or other multi-purpose spaces. An Aikido dojo is a transformational space. The word “dojo” is usually translated as “the place of the way.” You could think of it as roughly being a school, although there’s more to it than that. It is a dedicated place for intensive training, study, and personal development. A place to not only learn the technical how-tos of techniques, but to practice a way of being. We treat the dojo with reverence. The dojo is a place to discover and develop ourselves. We learn through physical training to be grounded and responsive, assertive and compassionate. We are rigorous and committed in our training, but not stern or grim. 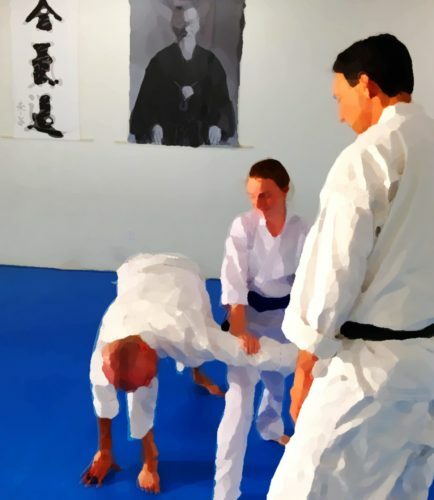 Aikido classes can be philosophical, vigorous, challenging, supportive, and fun, often all at the same time. We train with quiet, focused attention, but there’s also a lot of smiling and laughing at the dojo. Our facility at Aikido of San Diego is a good representation of a typical Aikido dojo. When we enter we pause and bow, taking a moment to recognize that we are stepping away from the outside world for a while to focus on our practice. There is a small area with wooden shelves just inside where we remove our shoes, both for the sake of not tracking in dirt, and out of respect for the space. You will see Sensei’s desk, two changing rooms, and a restroom. Near the mat there’s a small utility room for storing equipment and cleaning supplies. There is an area with chairs for people who come to watch class, and for parents to be comfortable during the children’s classes. Then there’s the mat. A vast expanse of firm, smooth blue mat that stretches from wall to wall, and all the way to the back, where a roll-up door reveals a garden area. On the side walls there are weapons racks holding the wooden practice weapons we use in some classes. At the edge of the mat we bow again, this time to the shomen [SHOW-men] – the front of the training area – a focal point of the space which includes a photo of O Sensei, the founder of Aikido. Then we step onto the mat to train. Before class we warm up, stretch, and greet our friends. When it’s time for class we sit together in a line facing the shomen, and Sensei or one of the other instructors begins the class with a bow to the shomen and to each other. After training we bow out, seated in line again, and thank our partners. Then some of us grab brooms to sweep the mat. Others water the garden, put out fresh hand towels in the restroom, clean anything that needs cleaning, and vacuum the carpeted areas. Now the dojo is ready for the next day’s classes. In addition to the area for Aikido training, some dojo also have simple living quarters for students who come to live there and train, sometimes for weeks, months, or even years. A few have water features, areas for meditation and tea ceremony, private offices, additional training spaces, or even vegetable gardens and koi ponds. Whatever the form – folding mats at a rec center, or an elaborate compound with student housing and gardens – the spirit is the same. The dojo is a place to leave distractions behind and pay attention – to our bodies, our minds, and our partners. It’s a place to practice mastery and presence. If you would like to learn more about the Japanese martial arts dojo (not specific to Aikido), both the physical space and traditions, get this excellent and interesting book by Dave Lowry: “In the Dojo: A Guide to the Rituals and Etiquette of the Japanese Martial Arts.” I highly recommend it to anyone with even a passing interest in martial arts.